Yourself and DG are cross-referencing to good effect at the moment. It might explain the higher-than-usual number of transport-related posts he's made lately on his blog! I read somewhere (on DG's site I expect) that this station cost £7.5million to build, and it's a DLR station (rather than a fully-blown Underground or railway station) in an area of low land values. That just goes to show that inflation in the cost of building stations costs has been massive in the last twenty years or so. I remember in the mid-1980s when a "basic" two-platform station cost £300k, and lots of places up North regained rail services as a result. That money might buy you one footbridge now. I know stations have to be fully-DDA and 'elf'n'safety compliant these days, but £7.5 million? Come on TfL/Network Rail/whoever! I haven't written about Langdon Park (yet). The Langdon Park site should have been really easy to build on - there was already plenty of space alongside the track. I bet it's the need for two lifts up to the footbridge that has caused costs to rocket. Langdon Park isn't a basic station - it has large, full length canopies on the platforms and even ignoring the lifts, the footbridge appears to be very wide and elaborate. Don't forget that the 3 car DLR trains the station is built for are almost as long (85m) as a 6 car Circle Line train (92m), and longer than most local trains in the north (which are often 30m Pacers), so the platforms alone are going to be a major cost. 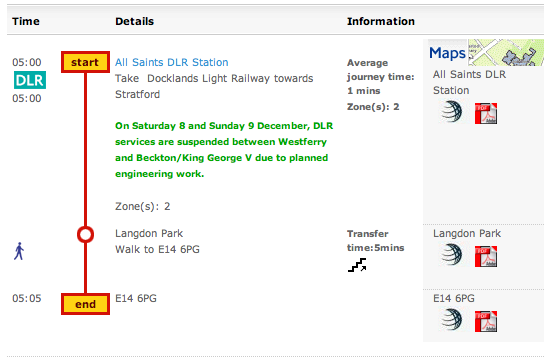 Well I'm intending to go have a look on Saturday, and maybe take a few photos - I pass through the 'station' almost every day and it does seem to have been built in an opportune spot - the way the geography is in that part of the East End it's probably quite difficult to get from there to the nearest existing DLR stations without wandering through industrial estates etc. Shame about the price though!